The Vock Conservation Area is a Burrillville Land Trust property that features a trickling stream, a carp pond, glacier boulders, the ruins of a mill, and an overlook called Fox’s Rock. The property was once owned by Edward Vock who emulated Henry David Thoreau after reading his book Walden. Vock lived on this land with his family, building a grist mill and a couple of houses. The property also features mountain laurel, birch trees, and hemlocks to name just a few. The deep snow revealed a plethora of various animal tracks. The property is a work in progress. 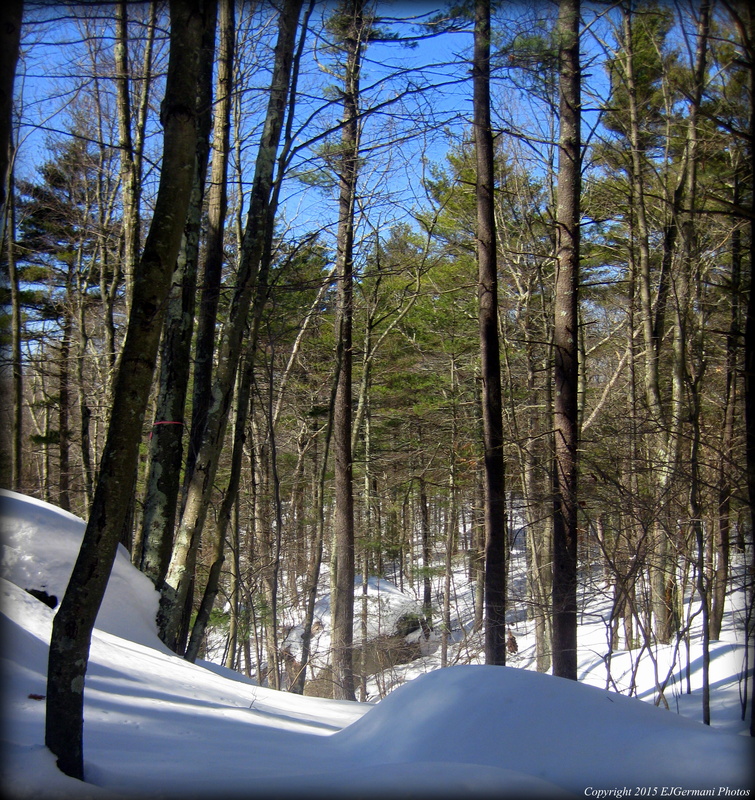 There are no marked trails and generally not open to the public except when the Land Trust hold special events. Today was one of those days. Paul Roselli led today’s snow shoe expedition. His knowledge of the property was quite impressive as he led us to all the highlights. The snow was still rather deep after one of the snowiest Februarys on record. I will have to keep an eye on the schedule to re-visit this property for a hike when the snow is gone. For upcoming events at this property (and others in the area) see the RI Land Trust Days facebook page or the Northwest Greener Living page on Meetup.com.